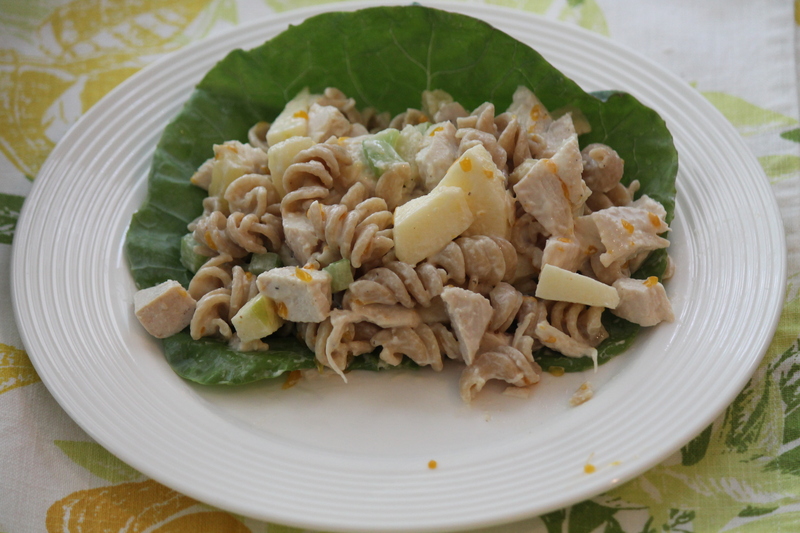 I first tried this chicken and fruit pasta salad when my aunt brought it to me after Scottie was born. It has the perfect combination of taste and textures and something I could easily pull out of the fridge and eat right away. No heating required and scooping the pasta into a separate bowl’s optional. 🙂 As a new mom with a baby just days old this was the perfect lunchtime meal when it was just me and the baby and an extremely short amount of time to get food in my belly. Taking a meal to a friend or family member who has had a baby is the greatest gift to give. Those first few weeks at home are tough, as everyone is trying to adjust to life with a newborn, whether or not it’s your first child or your fourth child. Having someone prepare dinner for a busy new mom and her family is one less thing she has to worry about after a long day and most likely long night as well. Two of my good friends recently gave birth to their first child so naturally this pasta came to mind as I was thinking of something to take them. Like I mentioned no heating is required and the addition of the fruit makes for a perfect summer lunch or dinner salad. I raved about this pasta to my aunt after she brought it over and asked if she would share her recipe with me. She mentioned she used to make this every summer while her and her daughter were at the beach for a fast and refreshing lunch as both of them loved it as well. In order to shave off a few calories and fat I chose to use half light mayonnaise and half plain Greek yogurt in place of the full fat mayonnaise. There’s a touch of sweetness and pop of color from the fruit and a nice crunch from the celery and almonds. This is one of those dishes that get better and better as time goes by. Cook Pasta in a large pot of boiling water till just done. Drain, rinse and set aside. Place almonds in a dry skillet. Toast over medium heat till lightly browned. 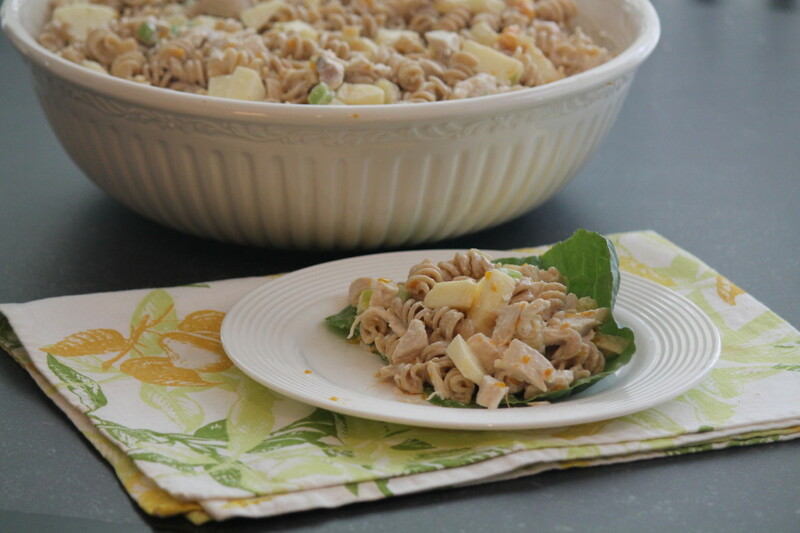 In a large bowl combine pasta, chicken, pineapple, apples, celery, mandarin oranges and toasted almonds. In a small bowl, mix together the mayonnaise, yogurt, reserved pineapple juice and almond flavoring. Stir into pasta and mix well. Chill in the refrigerator for several hours. Serve cold. This salad sounds so good! I love pineapple and mandarin oranges together… yum! great idea adding fruit! 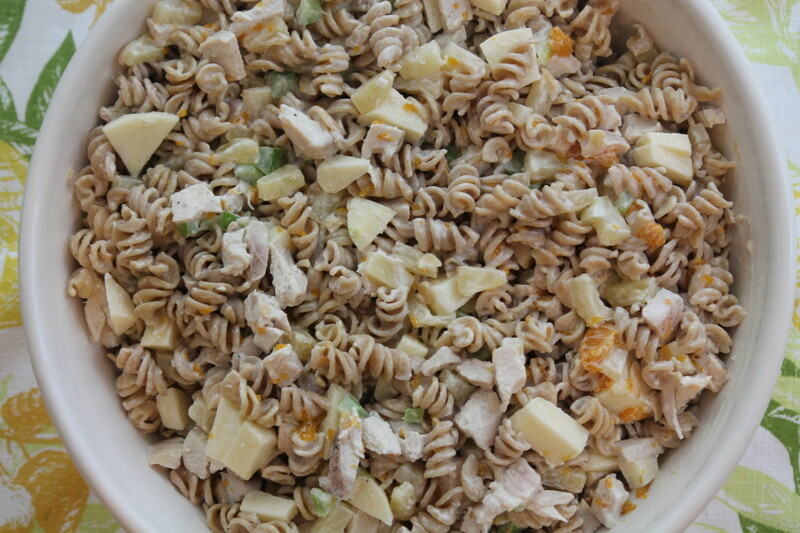 i make chicken/tuna salad all the time. definitely adding apples next time! This looks so good. 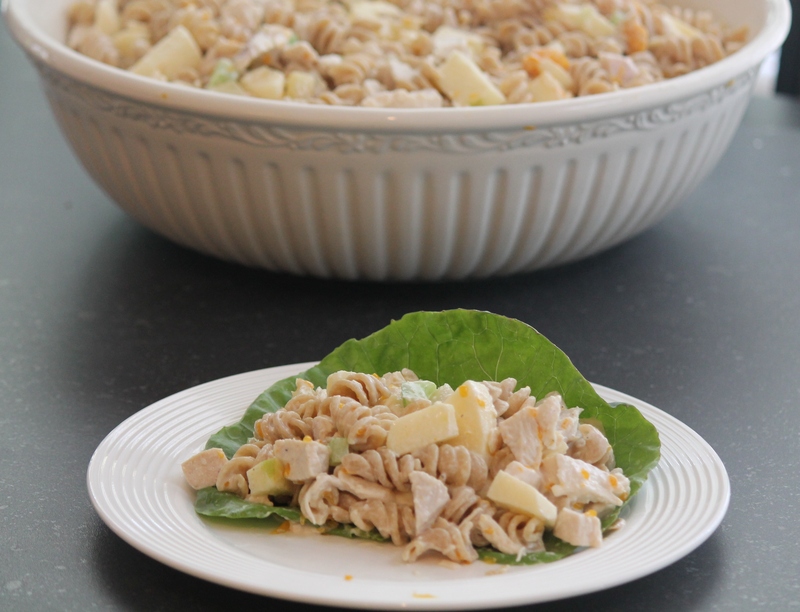 I love fruit with chicken salad. The pasta makes it a great dish!